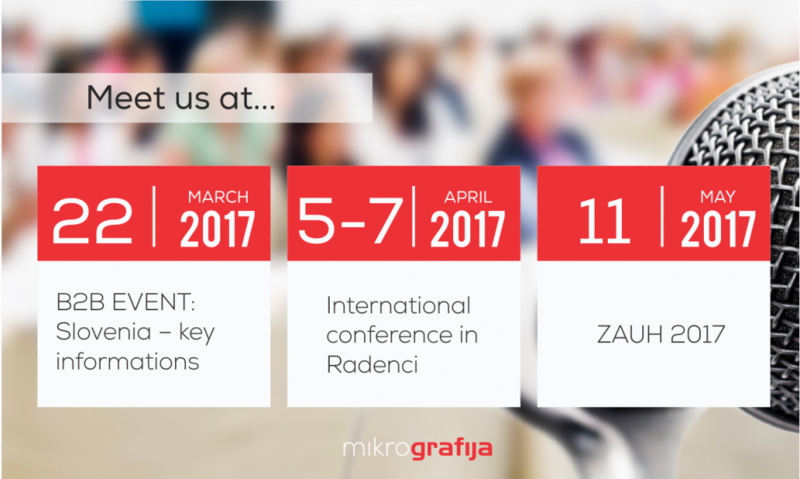 For a start you can meet with us on the 23rd of March 2017 at the B2B event ”Slovenia – key information’s”, organized by Halcom. At the event, we will be present with a lecture, which will be performed by Andrej Huč. You can also visit us at the international conference ”Technical and content problems of classical and electronic archiving” which will be held in Radenci from 5th till 7th April 2017. We will be present with a lecture ”Begin with a paper. Finish in the cloud” by Karmen Matkovič on the first day at 15.00 in the Congress Hall. If you are among those interested in the presentation of services and products in the area of capture, archiving, managing and data storage, than attend the fair ZAUH 2017 on 11th of May 2017 in Ljubljana. We will be present at the exhibition space and with a lecture.